Nanoparticles of silver are being found increasingly in the environmentand in environmental science laboratories. Because they have a variety of useful properties, especially as antibacterial and antifungal agents, silver nanoparticles increasingly are being used in a wide variety of industrial and consumer products. This, in turn, has raised concerns about what happens to them once released into the environment. Now a new research paper adds an additional wrinkle: Nature may be making silver nanoparticles on its own. A team of researchers from the Florida Institute of Technology (FIT), the State University of New York (SUNY), Buffalo, and the National Institute of Standards and Technology (NIST) reports that, given a source of silver ions, naturally occurring humic acid will synthesize stable silver nanoparticles. Our colleague, Virender Sharma, had read an article in which they were using wine to form nanoparticles. He thought that, based on the similar chemistry, we should be able to produce silver nanoparticles with humic acids, explains FIT chemist Mary Sohn. First we formed them by traditional methods and then we tried one of our river sediment humic acids. 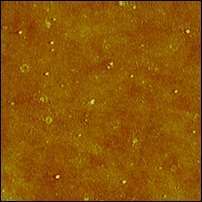 We were really excited that we could see the characteristic yellow color of the nanoparticles. Samples were sent to Sarbajit Banerjee at SUNY Buffalo and Robert MacCuspie at NIST for detailed analyses to confirm the presence of silver nanoparticles. Humic acid is a complex mixture of many organic acids that are formed during the decay of dead organic matter. Although the exact composition varies from place to place and season to season, humic acid is ubiquitous in the environment. Metallic nanoparticles, MacCuspie explains, have characteristic colors that are a direct consequence of their size. Silver nanoparticles appear a yellowish brown. The team mixed silver ions with humic acid from a variety of sources at different temperatures and concentrations and found that acids from river water or sediments would form detectable silver nanoparticles at room temperature in as little as two to four days. 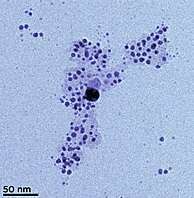 Moreover, MacCuspie says, the humic acid appears to stabilize the nanoparticles by coating them and preventing the nanoparticles from clumping together into a larger mass of silver. We believe its actually a similar process to how nanoparticles are synthesized in the laboratory, he says, except that the lab process typically uses citric acid at elevated temperatures. This caught us by surprise because a lot of our work is focused on how silver nanoparticles may dissolve when theyre released into the environment and release silver ions, MacCuspie says. Many biologists believe the toxicity of silver nanoparticles, the reason for their use as an antibacterial or antifungal agent, is due to their high surface area that makes them an efficient source of silver ions, he says, but this creates the idea that there may be some sort of natural cycle returning some of the ions to nanoparticles. It also helps explain the discovery, over the past few years, of silver nanoparticles in locations like old mining regions that are not likely to have been exposed to man-made nanoparticles, but would have significant concentrations of silver ions.